It's a popular belief that Eastern Bloc technology during the Cold War was limited to advanced beetroot-harvesting machines! Needless to say, this is far from the truth — something former East German microphone manufacturer Microtech Gefell GmbH have proven consistently with their range of condenser microphones. Hybrid amplifier technology, advanced ceramic capsules, phantom-powered valve preamplifiers — all of these are advanced designs, and many were in production years or even decades before the better-known Western companies developed anything similar. 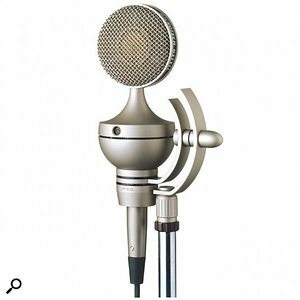 The Gefell company has now regained its rightful position as a major force in the microphone industry and is still innovating, as demonstrated by the subject of this review, the quirky but elegant UM900 valve condenser microphone. As far as I am aware, this is the first valve design to rely entirely on phantom power rather than employing a separate power and control unit. Opening the attractive wooden case housing the UM900 reveals a distinctive and stylish design, complete with an integral elastic suspension. The twin arcs of the suspension arms, combined with the almost deco styling of the microphone itself, redefine the term 'aesthetically pleasing' — at least to this reviewer. But the mic's styling is not simply decorative. Instead of the more usual cylindrical or wedge-shaped microphone grille, the UM900's capsule is housed in an oversized disk supported by a flared column from the main body of the microphone. Gefell claim this plays an important role in the acoustic behaviour of the microphone: the shaping is supposed to ensure that sound reflections are directed away from the capsule, and the oversized grille minimises the audibility of mechanical vibrations or resonances within the housing. All UM900s supplied in the UK have been the model shown here, with the integral twin-arc mount. However, two alternative mounting options are also available: a basic swivelmount (MH80) and a traditional cat's cradle elastic suspension (EA92). The standard twin-arc suspension relies upon the microphone's internal shock-resistant capabilities, and allows the microphone to be rotated about a horizontal axis through the 'spike' joining the two arcs but not, unfortunately, about a vertical axis (despite the apparent joint at the base of the microphone). In fact, the mount is fixed directly to the body of the microphone via three screws in the base. The front of the microphone is indicated by the engraved model name on the lower support bracket, and by the polar pattern selector. This six-position rotary thumb switch rotates without end-stops and offers omni, sub-cardioid, cardioid, hypercardioid, figure-of-eight, and cardioid again — five different patterns. Since the sixth switch position is available, it might have been nice if the second cardioid pattern had offered a reverse-facing facility — like the Neumann TLM170, for example — rather than just another forward cardioid. However, there is an element of convenience in the arrangement, as from one cardioid position a single click in each direction provides omni or figure-of-eight, and from the other, hypercardioid and sub-cardioid — allowing polar pattern adjustement in convenient steps according to your preferences. Towards the rear of the microphone, two further rotary thumb switches provide level adjustment and bass rolloff. Taking the last facility first, this is a standard high-pass filter offering either a flat response or 10dB of attenuation at 70Hz. The three-position level adjuster is rather more unusual, as it offers unity gain, 10dB attenuation, or 4dB of gain. The last automatically disables the polar pattern selector and provides a fixed high-gain cardioid response. Both of these rotary switches are also six-position types without end-stops, just like the polar pattern selector, so the filter can be selected by turning the switch left or right. The gain switch provides +4dB to the left and -10 to the right (followed by +4, zero and -10 again!). The UM900 is connected with a standard 3-pin XLR lead and requires a remarkably modest 4mA of phantom power current — less than some solid-state microphones. Every other valve microphone I've come across employs multi-pin connectors and an external power and control unit, so this Gefell microphone really is quite revolutionary in that respect. Apparently an internal 'switching power transverter' generates the anode and heater voltages for the valve preamplifier, as well as the necessary capsule polarisation. There is no information on the valve used, other than that it is a sub-miniature, low-noise type. However, an operational amplifier is used to drive the output transformer. The capsule is an M7 type — the original Georg Neumann design dating from 1943. The classic dual-diaphragm device uses gold-plated PVC membranes to create a pressure-gradient transducer measuring roughly 30mm in diameter. The assembly is supported by three shockmounts from the outer ring of the 75mm grille. The information sheet supplied with the mic claims a frequency response of 40Hz-18kHz (no limits given) and a sensitivity of 25mV/Pa (40mV/Pa with the +4dB cardioid facility). Self noise is 16dBA (IEC 651 measurement) and maximum SPL is 140dB at 0.5% distortion with the 10dB pad inserted. The UM900 weighs 900g and measures roughly 200mm by 75mm. The polar response plots for each pattern show a consistent presence peak in all modes, amounting to around 2dB at 5kHz and rising to 4dB by 10kHz. The omni response is commendably flat, but all the directional patterns exhibit a gentle LF droop. The figure-of-eight pattern is the worst offender, with sensitivity at 50Hz being about 14dB down on 10kHz. The other directional patterns have an overall tilt of between 4 and 8dB. The polar patterns are actually very accurate given the large diaphragm, and, as would be expected, there is considerable narrowing of all the patterns above 10kHz. The omni and sub-cardioids become narrow figure-of-eights by 16kHz, but remain impressively accurate below 10kHz. More importantly, the patterns change smoothly with frequency. The UM900 might look unusual, but its sound is truly sublime. The valve preamplifier makes itself known by adding a subtle but characteristic rich warmth to the sound, without imposing noise or any obvious spectral imbalances. The high end comes across as sparkling and detailed, although comparison with a B&K small-diaphragm mic reveals that, rather than having a truly open and extended range, the gentle emphasis on the 4-12kHz region creates this character as a compensation for the rapid curtailing of response above 15kHz. Not that I'm complaining — I can't hear much above that any more, and the mic sounded completely natural and acceptable on all the acoustic sources I tried, which included Bosendorfer grand piano, guitars, and various male and female voices. The bottom end seems well extended and natural. The gentle LF droop shown in the frequency-response charts on the directional patterns does not seem to cause any practical problems, and will often be compensated for by the proximity effect anyway. Despite the direct coupling to the microphone stand via the integral mount, the UM900 does not appear to suffer unduly from low-frequency rumbles. Best of all is the very clean and neutral mid-range, which comes across as being completely free of any kind of coloration other than the gentle valve warming already mentioned. Unfortunately I didn't have access to a Neumann U47 or M49 during my time with the UM900, which is a shame, because the comparison of East and West M7 capsules would have been fascinating. However, from past experience I would judge the Gefell microphone to be on a par with those early classics. Comparison with modern large-diaphragm mics like the Neumann U87 and AKG C414 highlights the smooth, warm, but natural character of the UM900 — not dissimilar to the U87, but richer and more involving (if that's possible). Indeed, I found myself preferring its detailed but unforced presentation on many sources. For the record, the UM900's list price would buy you any of the following: a pair of Rode Classic valve mics, a Neumann U87Ai with cat's cradle mount, a Neumann TLM170, a pair of B&K 4006 omnis, a pair of AKG 414B-ULSs, or three AKG SolidTube valve mics! Then again, in comparison with some of the best valve mics currently being manufactured, such as the AKG C12VR and Neumann M149, the UM900 looks remarkably cheap at less than two-thirds the price of those models! This Gefell microphone is a joy to use, being nicely balanced and with a mount which stays where it's positioned. It is very easy to forget the valve hidden away inside the UM900, because there's no song and dance about it — no windows to observe the glowing heater filaments — and the lack of a separate power supply conceals the fact (as well as neatly circumventing possible hum loops). The microphone certainly does not suffer by the absence of an external supply, though — noise, headroom and maximum SPLs are all comparable with solid-state microphones — so the internal 'switching transverter' obviously works well. The bottom line for any microphone is: does it capture sound with the required fidelity and quality? In the case of the UM900, the answer has to be an unreserved yes. If you're on a budget there are plenty of microphones which sound acceptable at a fraction of its cost, but where money is no object and sound quality is all, the UM900 is definitely up there with the best. If money is no object and you don't care what it sounds like, the UM900 looks pretty good too! Microtech Gefell GmbH were, in the days of the German Democratic Republic, known as VEB Mikrofontechnik Gefell, a nationalised company originally set up by Georg Neumann in 1943 after his own electrical factory in Berlin (from 1927) was damaged by an incendiary bomb. Gefell is a small town close to the old border between East and West Germany, about an hour's drive from Dresden, where the company retain strong links with the Technical University. To escape the bombing of Berlin, Neumann, together with his technical director Mr. Kuehnast and around 20 employees, set up a new factory in a disused textile mill to repair electrical appliances. The first microphone they made was the CMV 4a 'bottle' using the M7 capsule developed by Neumann and later used in his U47 and M49 microphones, as well as in Microtech Gefell's own current UMT70S and UM92.1S models. After the war, Neumann set up a new factory in Heilbronn making nickel cadmium batteries, before returning to Berlin to start the company we all know and love, Georg Neumann GmbH (now owned by Sennheiser). However, his former technical director, Mr Kuehnast, and most of the original staff remained in Gefell making microphones, and communication with Neumann was maintained, even after the German Democratic Republic nationalised all manufacturing industries. 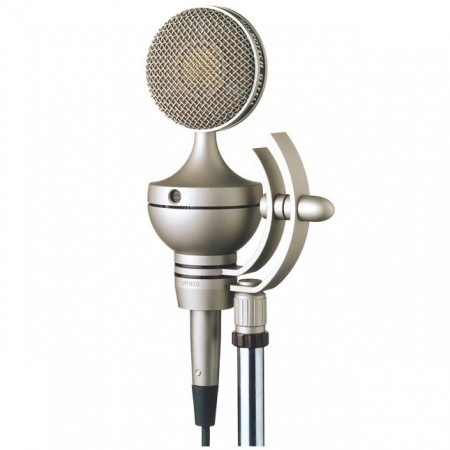 By 1957, Microtech Gefell had produced their first 3-pattern switchable valve microphone and introduced two more capsule designs, but when the Berlin Wall went up in 1961 all communications between East and West stopped. Because of Gefell's proximity to the East/West border customers were not allowed to visit the company, and even road maps of the area were drawn inaccurately to confuse visitors! Until 1972 the company had been called Georg Neumann & Co/Gefell, but with communism surging the names of the former owners were obliterated and the company was renamed VEB Mikrofontechnik Gefell — a 'People's' company! Through the '70s and '80s the company continued to develop various advanced technologies, including solid-state microphone amplifiers, and also undertook government-funded development of high-powered industrial lasers. In fact the company still uses a laser engraving machine to put the name and serial numbers onto their microphones! In 1989 the East German government finally collapsed, the Berlin Wall came down, and the Berlin Neumann company offered to co-operate with Microtech Gefell. Eventually Georg Neumann's heirs reclaimed a share of the company as former owners and, as part of the co-operation deal, the Neumann factory in Berlin tested the various Gefell microphones. Much to their surprise, they apparently found microphone technology more advanced than some of that available in the West. When Sennheiser took over Neumann GmbH in 1991 they severed all links with Gefell, which became an independent, privately-owned company in 1992. Since then, Microtech Gefell have introduced over a dozen highly regarded microphones for a wide variety of studio, broadcast, PA and measurement applications. Before the reunification of Germany, most of Microtech Gefell's microphones were used by Eastern Bloc broadcasters, and apparently their PM860 can be found in virtually every town hall and auditorium in the former Soviet Union. Currently under the technical supervision of Kuehnast's son, Microtech Gefell still produce the M7 capsule in exactly the same way Neumann taught the elder Kuehnast in the 1940s — hand-drilling each hole in the backplate, making the PVC membrane, and gluing it together by hand, just as Neumann specified. The M7 is currently used in the UM92.1S, the UMT70S, MT71S and UM900 microphones. Some of the production equipment which Microtech Gefell GmbH use for capsule production employs technology developed by the Soviets before Perestroika. Their most recently developed microphones, the M900 and M910, use a capsule made of a ceramic material moulded under high pressure and plated with chromium — technology developed in Moscow, perfected by Microtech, and unlike anything currently found in Western microphone designs. Good specifications for a valve microphone. The UM900 is individually styled and innovative. Its five switchable polar patterns, high-pass filter and attenuator make it a versatile microphone, while its superb, warm but detailed sound quality puts it amongst the best in its class. Expensive, but worth it.